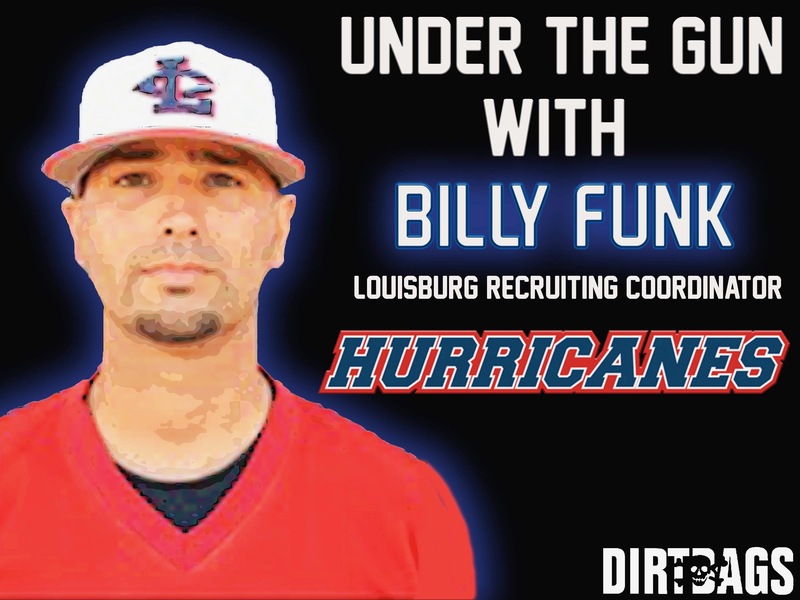 This week on Under the Gun, we are joined by Billy Funk, assistant coach and recruiting coordinator at Louisburg College. Coach Funk is in his first year with the Hurricanes in 2019 after two years at Wingate University. At Louisburg he is overseeing infield play. Coach Funk, you’ve had an array of experiences in your coaching career as you’ve been at some programs at various levels that have accomplished some noted successes. Take us through your path to your current position and share how each has impacted your development in the profession. As a coach, I feel that I’ve been blessed, blessed to be around some great programs, but blessed to be around some great head coaches. Jack Moore (HC at Rapphannock CC), Matt Jones (HC at Shippensburg University), Jeff Gregory (HC at Wingate) and now I have the privilege of working under Head Coach Blake Herring here at Louisburg College. Each stop has given me the opportunity to grow as a person and as an assistant coach. My first stop stop was at Rappahannock CC, where I played after high school. My main purpose, was to give back to the program that laid the foundation for my future success. Shippensburg University, located in Pennsylvania was my second stop as a volunteer assistant . The year before I joined Matt Jones’s coaching staff, Shippensburg Univ. made a World Series trip to Cary, NC to compete in the D2 world series. I think every coach who is starting their career, is grateful for the opportunity to coach, but to have one of your first opportunity with a program that is well established is truly a blessing. From Shippensburg, I traveled south to Wingate University and joined the Jeff Gregory coaching tree as a graduate assistant. Coach G, offered me the opportunity to not only be apart of his outstanding program, but was able to allow me to further my education by getting my Masters Degree. I was able to really dive in from the recruiting side of things, and to have Coach G’s trust was an honor. After 2 years with Wingate, I landed my first full – time job with Louisburg College under Head Coach Blake Herring. Louisburg College has always been a special place to me, because as a junior college player, I recall being in the visitors dugout at Frazier Field, and now I’m calling Frazier Field my home. Each school and each coach, current and past, has impacted my life in ways I can’t describe. The thing I will hold on to for the rest of my life, are the relationships that I’ve built along the way. All that I have accomplished up until this point in my life, is some way shape or form, has come through the game of baseball and for that, the game owes me nothing, but I owe it everything. Great coaches have impacted my life, but more importantly, they are all good men of life and to be friends with them, I will always be in their debt. As the recruiting coordinator at a JUCO, what are some challenges as well as benefits you face in finding and recruiting players? As a recruiting coordinator at a junior college, it’s special. It’s always an ongoing process with guys we’re recruiting for our program, and programs that are recruiting our guys. Recruiting is fun, I have the opportunity to meet so many different people and I get to hear their story as I build a relationship. The challenges as a recruiter at a junior college is just that, it’s a junior college. Every player wants or has dreams of playing high level D1 ball or professional baseball, so junior college doesn’t appeal to them. But that is also what makes it fun, because a junior college at times, is just a detour to get to where you want to go as a player. Nobody goes to a juco to stay, everyone wants to leave and move on to bigger and better things. They’re more benefits for sure though, we open the possibility of entering the MLB draft earlier as opposed to waiting after their junior year or 21 years of age. Juco offers players and coaches to have a more “hands on” approach with players, with more innings and reps, while NCAA schools are handcuffed because of hour restrictions. Once those players get on campus, what are some keys to helping them develop that serves both the program in reaching its goals and the player in enhancing their opportunities once they leave Louisburg? Louisburg College is a private, residential, 2 year school. Once players get on campus, they get the “4 year” feel. Meaning we have dorms, cafeteria, weight room and an athletic facility on campus. Having those things on campus really enhances the development of players. They lift, and then refuel their bodies with the proper nutrients in the cafe. After practice hours, they have full access to Frazier field, where they can master their craft either as a pitcher or hitter. Having dorms on campus is a huge plus for us, while typically other community college do not offer dorms nor a cafe. Apartments have to be rented out, rent, cable bill, internet and food have to be bought on a monthly basis. All of that is included here at Louisburg College, so student athletes only have to focus on academics and developing their skills. Players that utilize all of the resources that Louisburg College has to offer, are the players that continue to help this program win, and are typically the players that move on to bigger and better things. Louisburg College has a rich history in the game of baseball. Provide some insight as to what it’s like for coaches and players to be a part of such a program that is part of such a highly competitive league like Region X of the NJCAA. Louisburg College is the oldest 2 year school in the Nation. Just by saying that, there are high expectations to win and to win at an elite level. For coaches and players, I feel like it’s our job to keep the train moving forward. If there isn’t any pressure to win, what’s the point of playing or coaching. It’s that feeling, what make Louisburg College a special place. The NJCAA and Region X is very competitive, year in and year out. North Carolina and South Carolina are the two states that make up the Region X Division 1 conference, which makes it a great place to not only recruit, but to compete. Region X is combined with true freshmen talent and with Division 1 transfers across the board. Each weekend, Region X players are playing to help their program win while also trying to get recruited to play for outstanding programs up and down the east coast. Youth baseball plays a huge role in providing foundations for the players that will be on the recruiting radar in the coming years. What are your views on how youth baseball can provide the necessary competitive forces, with development and still allowing the game to be fun? We greatly appreciate your time Coach Funk. Best of luck you and Louisburg Baseball as you continue the season. The Dirtbags will be keeping our eyes on the Hurricanes in your quest to rise to the top of Region X.